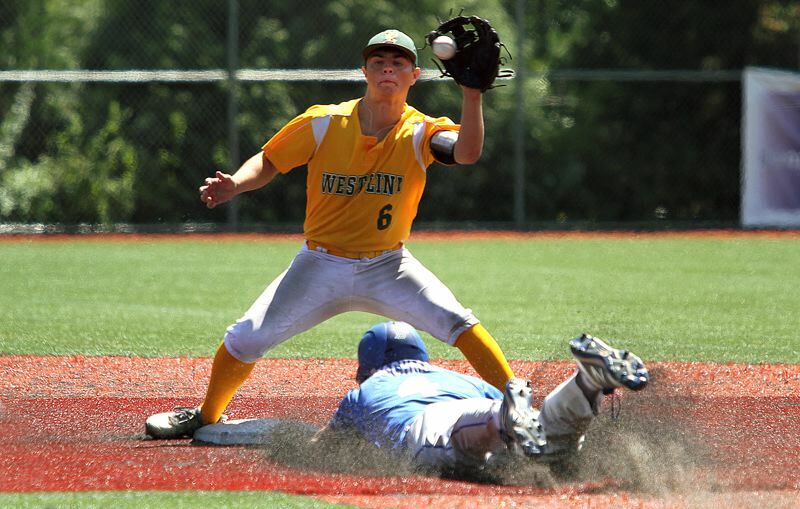 The West Linn baseball team had ruled, and rolled, in tournaments all summer long. The Lions won four straight games to reach the championship of the Northwest Metro Invitational Tournament in June. West Linn then won its pool and semifinal to reach the championship of the Firecracker Classic at Lakeridge High School on July 1. So when the Lions rolled into the 2018 Oregon Independent Baseball Association playoffs, they knew they'd be ready. West Linn played its way into the OIBA semifinals, but saw things go south there, dropping a 2-1 decision to Grant at Lake Oswego High School on Saturday. The Lions' summer season came to an end in great part thanks to the performance of Generals' pitcher Boone Rush, who gave up just one run on three hits, one walk and one hit batter while striking out nine. "He started everybody off with a fastball and you knew he was coming curve (after that), but he located inside really well, he located outside really well and he threw a lot better than when I saw him warning up," said West Linn pitcher Brandon Alexander, who threw a complete game, allowing two runs on seven hits and no walks with two strikeouts. "He was throwing pretty hard and it tailed, too, since he's a lefty," said West Linn designated hitter Parker Stevenson. "He'd just come back with the curve, and with the curve, you're less likely to hit it." After a scoreless first inning, Grant broke through to score one run in the top of the second inning and another in the top of the third. In the second, Alex Wagstaff led off with a single to center field and later scored on Cooper Shaw's ground ball to second base. Then, in the third, Will Bachman singled to left with one out, stole second and scored on Spencer Scott's double to right to make it 2-0. The Lions, who stranded one runner in each of the game's first two innings, broke through to score their lone run in the bottom of the third when Adam Simshauser led off with a single to right, stole second, took third on Chase Bartley's ground ball and scored on a wild pitch with Zach Bell at the plate. And there, at 2-1, is where the score stayed the rest of the game. Alexander gave up two hits in the fifth, but escaped without allowing another run, while the Lions got a two-out walk in the fifth but failed to score there and didn't get another baserunner in the game's final two innings. For the game, Bell, Simshauser and Stevenson had West Linn's three hits, while Bachman went 2 for 3 to pace Grant. Despite the loss, the Lions knew they'd made great improvements over the course of the summer that will serve them well next spring. "I made strides a lot in pitching, just becoming more confident and hitting spots," Alexander said. "And hitting as well. Just seeing much faster pitching and better pitching and just getting used to it. That's where I made my strides." "It's been great because then you're prepared for the next season," Stevenson said. "You're not going into the next season like it's all new because you've just been doing it the whole summer so it helps a lot. "I've definitely gotten better at hitting because the pitching is a lot harder on varsity than JV. I've gotten better at that." The Generals then advanced to the OIBA championship on Saturday against Clackamas, dropping a 5-3 decision in the OIBA finale.